Some document leaks are more equal than others. The New York Times, along with other media outlets, on Monday published excerpts from the latest stolen document dump from WikiLeaks - sensitive American diplomatic cables, mostly from the last three years, discussing nuclear and terror threats. "Leaked Cables Offer a Raw Look Inside U.S. Diplomacy" was the headline over Scott Shane and Andrew Lehren's story, which dominated Monday's front page. But the more important reason to publish these articles is that the cables tell the unvarnished story of how the government makes its biggest decisions, the decisions that cost the country most heavily in lives and money...As daunting as it is to publish such material over official objections, it would be presumptuous to conclude that Americans have no right to know what is being done in their name. 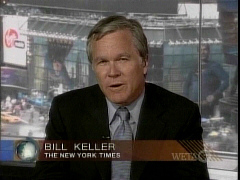 Keller invited readers to weigh in at askthetimes@nytimes.com. While the Times managed to overcome whatever qualms it had against running pieces of the diplomatic correspondence, bloggers like Scott Hinderaker at Powerline remembered the paper's quite different reaction to another trove of sensitive and damning emails - the controversy that came to be known as Climategate. In November 2009, former Times environmental reporter Andrew Revkin snootily informed readers of his nytimes.com blog that he would not be publishing the raw emails: "The documents appear to have been acquired illegally and contain all manner of private information and statements that were never intended for the public eye, so they won't be posted here. But a quick sift of skeptics' Web sites will point anyone to plenty of sources." While Revkin provided a link to skeptics on his blog, his front-page story on Climate-gate only relayed excerpts from the emails. By contrast, the Times ran raw data from 14 leaked cables in the print version of its massive story on Monday. I wondered why, if the Times believes that openness is so important to the operations of the U.S. government, that same logic doesn't apply to the newspaper itself. The Times, after all, is still, despite its loss of influence in the Internet age, the leading newspaper in the U.S. and indeed the world. It still shakes governments, shapes opinions, and moves markets, even if it doesn't do so as often or as much as it used to.